We are an open plan nursery and are split into 3 rooms. We have a large outdoor playground with a range of play equipment for endless fun. We have trikes, bikes and scooters suited for all ages. As well as a garden in the top of the playground for lots of digging and planting. This is the baby room and caters for children aged from 3months to 18months. The room is staffed by qualified and experienced nursery nurses, who provide a caring and homely environment in which your baby can feel safe and secure. Activities take place throughout the day such as heuristic play, messy play, music and movement etc, to help your baby thrive and grow. This is the toddler room and caters for children from 18months to 3years. Room leaders plan activities around the seven areas of learning and key persons plan follow-up activites based on their child's needs and interests. Key persons are responsible for liaising with parents and reporting daily achievements. This is the pre-school room and caters for children from 3years and above. This room is more structured from the rest as it prepares the children for school. Children are encouraged to become independent and develop in all areas. 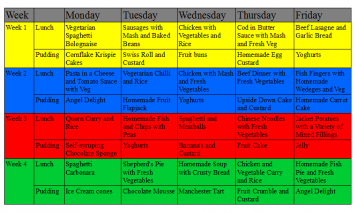 A wide variety of foods, based on a four week rota.